A healthy immune system is essential to protect you against disease and prevent infection. You can boost your immune system by eating foods containing antioxidants, vitamins, and minerals. Supplements are also helpful to strengthen your immunity as they can address any nutritional deficiencies and give your immune system a boost. Some of the best foods that are immune boosters are garlic, ginger, green leafy vegetables, and citrus fruits. The rich vitamin C, vitamin E, and natural antioxidant content mean these types of foods are great for health. These immune-boosting foods can help you avoid colds, the flu, infections, and even prevent chronic infections. Immune system supplements also help to increase white blood cells to help you when you are sick. Some of the best supplements for the immune system are selenium, zinc, curcumin, olive leaf extract, and echinacea. 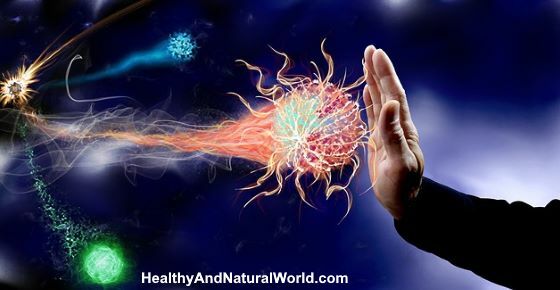 In this article, you will learn about natural immune boosters that will help improve your health. Immune boosting supplements and foods can help to prevent disease and also help you recover quicker from a bacterial or viral infection. At the end of the article, you will find a recipe for a health tonic that combines some of nature’s most potent plants which will help to kill your infections. This natural antibiotic has a strong taste and creates a powerful concoction. Boosting your immune system with a healthy diet and appropriate supplements can help keep you in good health. Immune-boosting foods help your body fight infections caused by bacteria, viruses, fungi, and parasites. Your immune system detects these ‘foreign’ invaders and increases white blood cells (WBC) to kill off the organisms. In order to ‘win’ the battle, your immune system should be as strong as possible. Most doctors agree that the best way to strengthen your immunity is through a healthy lifestyle that involves a good diet, regular exercise, and getting enough sleep. You can also take supplements that support a healthy immune system. This can help to prevent any vitamin or mineral deficiencies that can put you at risk of infection and disease. Let’s look at some of the best foods you can add to your diet to help keep you well and healthy. Garlic is a pungent herb with antimicrobial properties that can help ward off infections and strengthen your immunity. Learn about other ways to use garlic as a natural antibiotic and why it is always best to crush garlic and wait few minutes before using it as a medicine. Ginger is an immune-boosting ingredient that you can take as a food or supplement for immune support. Find out more information about why using more ginger in your diet can help to improve your health. You can also find a recipe to make your own anti-inflammatory ginger and turmeric tea. Vitamin C is one of the most important vitamins to boost the immune system and help you ward off infections. If you really want to boost your immunity when you are sick, then you should increase your intake of citrus fruits. Consuming oranges, lemons, and grapefruit can help to increase your body’s ability to fight off infection. You may be surprised to learn that guava fruit has 4 times the amount of vitamin C than oranges. Find out why starting your day with a glass of lemon water can help to keep you healthy and improve your immunity. Another vitamin needed for your immune system to function properly is vitamin E. Like vitamin C, vitamin E is a powerful antioxidant that helps to stimulate your body to fight disease. Find out why one of the best nuts to consume for healthy immune function are walnuts. Regularly consuming foods such as raw yogurt, kefir, sauerkraut, and miso help keep your immune system healthy. The reason why these foods are good for your immunity is that they contain probiotics. For more information on the benefits of probiotics to your digestive health, immunity, and mental health, please see my article on probiotics for good health. One of the best food groups to include in an immune-boosting diet is green leafy vegetables. A 2018 study on the benefits of eating broccoli found that compounds in broccoli help to boost immunity and may also help prevent the development of cancer. (21) You can read more about the health benefits of broccoli in this article. You may be surprised to learn that consuming mushrooms can be good for your immune system. Learn more about the benefits of adding maitake and shiitake mushrooms to your healthy diet. Including fruits and vegetables in your diet that have vibrant colors can help to ensure that you get enough vitamins and minerals for a strong immune system. For example, orange and yellow vegetables contain beta-carotene that strengthens the immune system. Another of the great foods to enhance your immune function and help stay healthy is Brazil nuts. Further reading: the amazing health benefits of Brazil nuts. Regularly drinking a cup or two of green tea every day can help keep you healthy and prevent disease and infections. You can find more information about green tea in my article about the proven benefits of green tea. Consuming chicken soup is one of the best foods to eat if you have a cold or other viral infection. Did you know that chicken soup is one of the proven remedies to help break a fever fast? All of the foods that help to boost your immune system work effectively due to one or more minerals or vitamins in them. You can also help to prevent infection by using the best supplements to enhance the immune system. Turmeric contains a compound called curcumin that helps to strengthen the immune system and prevent disease. Learn more about the many health benefits of taking curcumin supplements to help strengthen your immune system. Another of the immune system supplements that can help prevent disease and infection is folic acid. In order to keep your immune system functioning as it should, you need to have adequate levels of iron in your blood. It is important to spot the signs of an iron deficiency to determine if you need to take a supplement to increase iron levels. You need to have adequate levels of selenium to make sure that your immune system works effectively to combat disease. Learn about the tell-tale signs of a selenium deficiency and what you can do to prevent it. Many supplements to enhance the immune system contain zinc because it helps to prevent immune dysfunction. If you have a zinc deficiency, you can take a zinc supplement to help support your immune system. One of the best immune booster supplements you can take to stay healthy is olive leaf extract. Learn more about the health benefits of olive leaf extract and find out how to make your own immune-boosting olive leaf tea. Echinacea is a medicinal herb that stimulates the immune system and can help you fight off a cold or flu infection quicker. If you want to get rid of a winter cold virus quicker, find out how to make your own health-boosting echinacea tea at home. One of the supplements to boost your immune system is astragalus. If you are feeling sick and under the weather, taking ginseng supplements can help your body recover quicker. This wonderful health tonic combines some of nature’s most potent plants and brings them together in a powerful concoction. It is not for the squeamish as the taste is strong and hits your taste buds with unusual force. But the health benefits are manifold, so it is definitely worth the effort. The master tonic has been credited with healing not only common colds and infections, but also chronic conditions and antibiotic-resistant infections. It is 100% natural and works as an anti-bacterial, anti-viral, anti-parasitic and anti-fungal substance. It boosts your immune system and helps you combat even stubborn diseases. It combines garlic, onion, horseradish, ginger, hot peppers (chilies) and apple cider vinegar. All ingredients should preferably be organic and have to be used fresh. Prepare all your ingredients. Put them in a glass jar so that the jar is ¾ full with equal parts of the chopped and grated ingredients. You can either use small jars or go for big gallon glass jars. Pour apple cider vinegar over the ingredients until the jar is full. Make sure all the ingredients are covered by the liquid. Close the jars and shake them vigorously, so the ingredients mix and bind. Store the jars in a dark and cool place for at least 2 weeks and shake them daily. After 2 weeks, use a colander to drain the liquid into a different bowl. Line the colander with cheesecloth and place the mixture in it. Press all the moisture out of the mixture. At the end, wrap the cheesecloth around the remaining mixture and squeeze out the rest of the liquid. Pour the tonic into glass bottles using a funnel. You can use 8 oz. (200 milliliters) amber bottles or any other size. For a general immunity boost or for fighting candida overgrowth, mix 1 to 2 tablespoons in a cup of water. Drink twice daily. As mentioned earlier, be prepared for the spicy, potent taste. If you are battling an infection, take the tonic 3 to 4 times a day. The tonic’s ingredients quickly enter your bloodstream and detox the body. They stimulate your immune system and improve the circulation. Each of them has numerous health benefits. Garlic is a natural broad-spectrum antibiotic (read more about garlic in my article how to use garlic as a medicine). Onion has antibiotic and anti-inflammatory potential and is very good for respiratory infections. Horseradish is antibacterial and anti-parasitic. Ginger is known for its antimicrobial properties and it aids digestion (read more about ginger in my article how to use ginger as a medicine). Hot peppers act as natural painkillers (read more about cayenne pepper here). The list of apple cider vinegar’s healing benefits is very long. When all these jewels come together, you get a universal tonic that will help you maintain and improve your health. Supplements for immune system booster are now overwhelming. But in fact, I do believe not all of them work, though this varies from person to person. Lifestyle measures such as well-balanced diet, exercise, stress management, and good sleep are much more useful to keep the body immune system at its best performance. Just my 2 cents.